Opening Scripture: Haggai 2:3-10 NLT “Then the Lord sent this message through the prophet Haggai: 4 “Why are you living in luxurious houses while my house lies in ruins? 5 This is what the Lord of Heaven’s Armies says: Look at what’s happening to you! 6 You have planted much but harvest little. You eat but are not satisfied. You drink but are still thirsty. You put on clothes but cannot keep warm. Your wages disappear as though you were putting them in pockets filled with holes! 7 “This is what the Lord of Heaven’s Armies says: Look at what’s happening to you!8 Now go up into the hills, bring down timber, and rebuild my house. Then I will take pleasure in it and be honored, says the Lord. 9 You hoped for rich harvests, but they were poor. And when you brought your harvest home, I blew it away. Why? Because my house lies in ruins, says the Lord of Heaven’s Armies, while all of you are busy building your own fine houses. 10 It’s because of you that the heavens withhold the dew and the earth produces no crops. 1. When God saves us, He does a miracle of transformation in our inner person called the new birth, or being born-again. Our spirit becomes brand new. 2. God’s plan is for the fresh and new spiritual reality that is in our born-again spirit, to migrate outward to our mind and thoughts and attitudes and actions. 3. The process of being changed into the image of Christ depends on our willingness to embrace God’s truth as it is revealed to us. Revelation brings transformation when we act on it by faith. James 1:22-25 AMP “But be doers of the Word [obey the message], and not merely listeners to it, betraying yourselves [into deception by reasoning contrary to the Truth].23 For if anyone only listens to the Word without obeying it and being a doer of it, he is like a man who looks carefully at his [own] natural face in a mirror;24 For he thoughtfully observes himself, and then goes off and promptly forgets what he was like.25 But he who looks carefully into the faultless law, the [law] of liberty, and is faithful to it and perseveres in looking into it, being not a heedless listener who forgets but an active doer [who obeys], he shall be blessed in his doing (his life of obedience). 4. One of the areas Jesus Christ spent a lot of time teaching was on financial stewardship. Jesus taught that how we handle money and material things has a great influence over our spiritual life. 5. From the very beginning it has always been God’s plan to bless and prosper His people, like any good father or mother wants to do for their children. We must renew our minds to the promises of God so we do not handle finance out of fear. Lk 12:32 NKJV “Do not fear, little flock, for it is your Father’s good pleasure to give you the kingdom. 6. When we understanding God’s plan for Kingdom Economics, we begin to trust that God’s plan is never to decrease us but rather to increase us, so we can do more and more to advance His Kingdom. But like all of God’s promises, His promises take faith. 7. Under the New Testament Jesus Christ has removed the curses by becoming a curse for us. He now asks us to do out of a new nature of love and a new life, what was formerly a law and a commandment. We now keep God’s commands, not to avoid the curse, but because we share God’s nature. 8. God established the tithe as the means by which He funded religious worship, teaching, and the ministry of the priesthood. A. There were twelve tribes or branches of Israel, but God chose one tribe, the tribe of Levi, to serve the other eleven tribes as priests, meaning this was their full-time occupation and career. This meant that the other eleven tribes would each take responsibility for a tenth or 10% of the cost of supporting the Temple and the priesthood. B. This is why Mal 3:10 says “so there will be enough food in my Temple.” The tithes of the other eleven tribes literally helped to feed the Levites so they could serve the altar and conduct the sacrifices for the people. C. This practice of the tithe was carried over into the New Testament as the means by which God ordained that the local church and its ministers would be supported. D. The Bible makes it clear in the New Testament that the law was merely a shadow of greater things to come. If under the law God asked His people to give 10%, would grace in the New Testament ask us to do less? No, the idea of grace is that God wants to do it through us even bigger and better than the law could ever do, because we now share His nature, and because He wants to bless us even more that the law promised. 9. In the New Testament, Jesus confirmed the tithe, but used His apostles to teach us not to give for the wrong reasons. Giving is worship, and God doesn’t want us giving grudgingly or because we think we have to. No, the goal of giving under grace is give out of love. 10. The bottom line today is that if we are living by faith and walking in the grace of God, God wants us to support our local church cheerfully so that our congregation has a home with pastors and spiritual leaders who can give themselves to the ministry without distraction, in order that we may be a lighthouse to our community. A. The tithe, or first tenth, is a great place to start giving, because God still considers the tithe holy. But under grace, the tithe is a terrible place to stop. It all belongs to God, and sometimes God will ask us to go beyond what was required under the Old Covenant. B. God asks us to bring tithes and offerings to our local “store house” where we are fed. Today this is our local church where we are in covenant relationship with other Christ-followers. 1) Giving to other ministries is fine, but this should never come from the tithe. That is what our remaining 90% is for, to give offerings or whatever else we see is needed. If we eat at Wendy’s, but pay our bill at McDonald’s, how long can Wendy’s stay open? 2) Giving to other family members who may be in need is Biblical, but this should never come from the tithe. Again this is what God has allowed us to keep the 90% for. Be generous out of what is yours, not what is God’s. 3) Giving our time is not the same as giving a tithe. It is expected that all Christ-followers will invest their time in helping serve the local church and build God’s Kingdom. But serving and tithing are two different things in Scripture, and to confuse them is not good Biblical interpretation. C. The tithe is the first fruits of all our income, not just what is left after we pay taxes, and retirement, and whatever else is being withheld. Be honest with God about your tithe because He already knows. 11. Why should I tithe? A. Because everything you have, God gave it to you, and tithing is how you say thanks to God. It is like God gave you ten apples, and asks that we give one of them to Him out of appreciation. B. Because it supports your pastors and staff so they can give themselves to the Word and prayer, and take care of the church and its membership. C. Because it makes it possible for your church family to have a “house” to worship in, and pay the same bills you pay, such as utilities and upkeep. D. Because tithing keeps us free from selfish and shallow living. E. Because tithing teaches us to trust the Lord. F. Because tithing teaches us to always put God first in our lives. 12. What is the temptation of not tithing and how can we overcome it? A. Fear is always the temptation that prevents us from obeying God, because we don’t trust that God can take care of us. B. We probably already spend more than our tithe on other non-essential things. Some people may pay more for a membership at the YMCA or local gym than they give their local church. Or they may be willing to spend $50 to take their family to a movie, but not consider that their local church cannot exist without faithful supporters. In many cases it is necessary to rebudget and repurpose what we are already spending so that it is represents the new life of Christ in us, and not the old life we have been saved from. C. When our income is small, giving one dollar out of ten dollars earned baby-sitting or mowing yards is not so hard. But when we are making $30k, $40k, or $50k a year, the temptation is to not want to give the 10%, or the $3k, $4k, or $5k this would require. But we have to remember who gave it to us in the first place, what He has asked us to do with it, and that He can take it away and give it to someone else who will be faithful. We have to also consider that He may have already done that, if we are stuck in a rut and are never able to get ahead. 13. God is inviting us to a RELAUNCH in our finances by remembering the Lord’s tithe. Try it. Let Him prove Himself to you. Obedience is the place of blessing, and it is always God’s desire to bless you!!! God invites you to prove Him. 1. RELAUNCH means redefining God’s dream for your life. What have you given up on? What have you forgotten? Maybe it’s time to look again. 2. RELAUNCH means letting go of whatever is holding you back. 3. RELAUNCH means going the distance and not giving up. 4. RELAUNCH means embracing change without getting offended. Wikipedia writes “”Who Moved My Cheese?” is a motivational book by Spencer Johnson written in the style of a parable or business fable. The text describes change in one’s work and life, and four typical reactions to said change by two mice and two “littlepeople”, during their hunt for cheese. It has sold over 26 million copies and is now in 37 languages. Allegorically, Who Moved My Cheese? features four characters: two mice, “Sniff” and “Scurry,” and two littlepeople, miniature humansin essence, “Hem” and “Haw.” They live in a maze, a representation of one’s environment, and look for cheese, representative of happiness and success. Initially without cheese, each group, the mice and humans, paired off and traveled the lengthy corridors searching for cheese. One day both groups happen upon a cheese-filled corridor at “Cheese Station C”. Content with their find, the humans establish routines around their daily intake of cheese, slowly becoming arrogant in the process. Savor The Adventure And Enjoy The Taste Of New Cheese! They Keep Moving The Cheese. 4-A. God is not trying to push you out, He is trying to push you up. Promotion in the spirit means doing something we have never done before and going where we have never gone. 4-B. Don’t give in to feelings of not being appreciated for the hard work and dedication of the past.What got you here won’t get you there. When God does a new thing, it causes a shift out of one gear into another, like going from 1st to 2nd gear. 1st gear is not unappreciated, or being discarded for failing when you shift gears. It did it’s job. But it is not possible to get to cruising speed if you stay in 1st gear. Similar to the launch of a rocket there are stages that accomplish their purpose of reaching escape velocity, and then are jettisoned for the next stage. If the rocket holds on to a stage that is over, it becomes detrimental to the mission of the rocket. We must be careful not to get offended when we feel the pressure to let go of a stage that is finished. Properly understood, God is showing you that He loves you and doesn’t want you to get left behind when gears are being shifted and rockets booster stages are being jettisoned. Remember point A. You are not being pushed out, you are being pushed up. 4-C. God is doing you a favor by pushing you out of the nest you are comfortable with. Remember the mother eagle and her eaglets. Eagles were made to fly. 4-D. Be careful of being more committed to your job/career than you are your calling. God doesn’t give us a career to take us away from our calling, but rather to help us fulfil our calling. We can’t get this in reverse or we can get offended when God begins to deal with us about our calling. Paul spent a season making tents so he could obey his calling. He did not give up his calling to be become the leading tent maker in the world. He used his career to support his calling and became the leading apostle, and wrote over half of the New Testament. Your calling is the most important thing in your life, not your career. Don’t get this confused. Your calling is your divine purpose that God created you for. Your career is a means to fulfil your calling. It pays you so you can do your calling. Don’t sell out to your career when you aren’t willing to sell out to your calling. Let your calling drive your career, not the other way around. God saved you for a holy purpose, and it is about more than making a living, it is leaving a legacy. 5. God’s RELAUNCH for you must become personal. Ask God to give you a desire and vision for personal growth, and growth in your ministry, not just maintenance. Make sure Jesus is the main thing in your life, and not anything or anyone else. 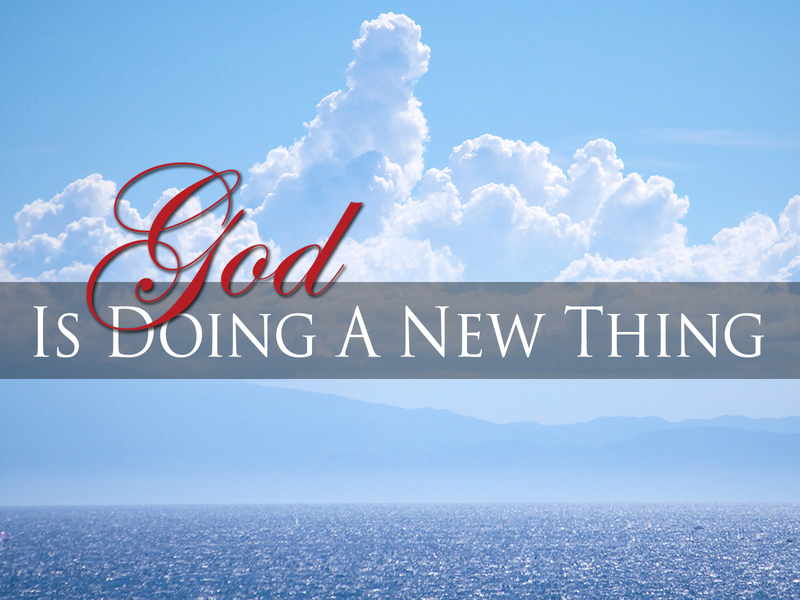 Talking about God doing a “new thing” in our lives is one thing, embracing it is another. It is easy to accept on a conceptual level that God wants to do a new thing in our lives, without actually embracing it. We can say “amen” to the messages and lessons, and still not have owned it for ourselves. Sometimes we can be willing to accept that our church has embraced something, and even be excited about it, without making it personal. Example: I can accept on conceptual level that exercise is good for me. I can be in full agreement with this concept. I can be happy for everyone else that is buying in to this concept and changing their lives. But until I get off the couch and begin to walk or workout, I have not embraced it. If you keep doing the same things, there can be no change. Your vision and desire are your ceiling and destiny. Time to practice listening. What is God saying to you about a personal RELAUNCH? Your success at transitioning forward without offense will come as a result of intentional listening and obedience to the voice of the Lord. 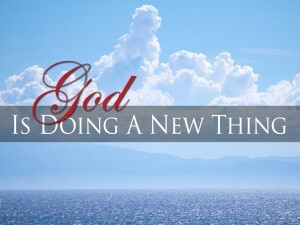 God is doing a “new thing” in His church today, and in your life. There is a divine shift happening as we go from present glory to future glory. While there is always a continuous sense of God’s progressive work, I believe there are also times when God does a quick work, and “suddenly” there is a major change over a brief perid of time. Get ready for another “suddenly.” Old things are passing away and the new thing is being revealed. One analogy from the OT is during the exodus from Egypt when God’s cloud moved by day, and the pillar of fire by night, to lead the Israelites to the promised land. The provision and protection were in the cloud and pillar of fire. Anyone that did not move with the cloud lost out on what God was doing. It’s time to break camp, for the cloud is moving again. Another analogy comes from when Jesus taught that new wine must be put into new wineskins, or both will be lost. Many of us have been trying to put new wine into old wineskins (habits, methods, organizational systems, etc.). This is why nothing that man-made-religion builds can sustain the presence of God. God does not dwell in what men build, only in what He builds. Don’t be afraid of new wineskins. They are the only thing that can contain new wine. I remember when the charismatic renewal had to go outside of the traditional church because man-made religion wouldn’t allow it to change their traditions. Millions of people were swept into the kingdom of God and the baptism in the Holy Spirit, who would never have darkened the door of church. They were hungry for Jesus, not our religion or programs. I remember when the Jesus People Movement became the most powerful and galvinizing force for teens and twentysomethings that this nation has ever seen. The movement had to go outside of the institutional church as the Chuck Smith’s of that day began baptizing them in the ocean, long hair, flower power, and all. Millions of teens answered the call to follow Jesus, not organized religion. I was one of them. I believe we are at the door of another Great Awakening in America and around the world. Will the church let it in, or will it have to pass us by? Many of you have been praying for a fresh move of God that is more than just a series of good services. Get ready. God is about to do it again. Many of you have been faithful through some hard times. I declare to you by the word of the Lord, God will not pass you by or forget your labor of love. You have been in preparation for such a time as this. Your reward is on its way. Remain willing and obedient. Challenge every habit and tradition and be willing to change what God says has served its purpose and is time to retire. He is streamlining things for a fresh ingathering. If we won’t let the old things go that need to go, we are worshipping an idol and not God. I have been guilty. I am being changed by the Spirit of the Lord. Stay in faith for the exeedingly, abundantly, above all you can ask or think. God has made promises to you, and He will fulfil them. 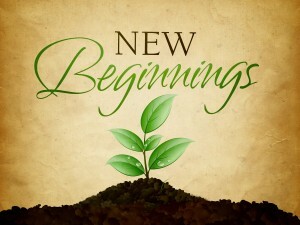 He is doing a new thing, and now it springs forth, in Jesus name. Don’t give up on God’s promises in your life. God does not count time as we do. 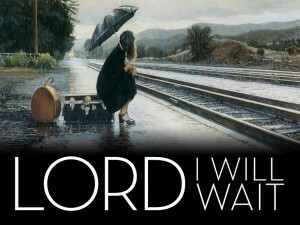 Wait patiently, and with faith in His faithfulness, and you will receive them. Delay is not denial. Timing is everything. 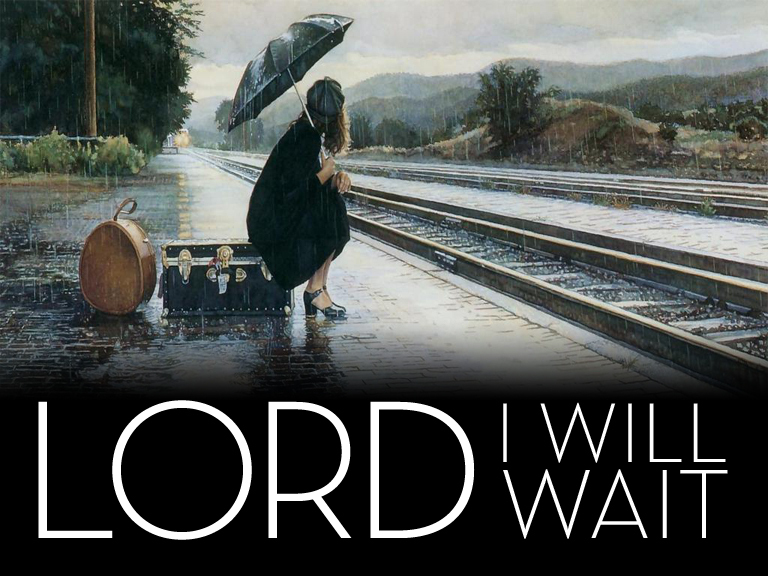 Wait on the Lord, be of good courage, and He will strengthen your heart. Hey church leaders, when you accept an invitation to lead a ministry in your local church, be willing to meet with and receive training and mentoring from your pastors. It’s their job to help equip you to be successful, and teach you how your ministry fits into the blueprint God has for the whole church. They have yours AND the church’s best interests at heart. Leading other people under Christ is a great responsibility, and must be accompanied with great humility in order that Christ to be glorified, the flesh mortified, and the devil horrified. Humble yourself so that grace can flow to the low place. 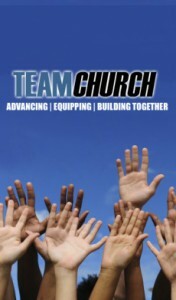 Teaching everyone about how to work together in ministry is the only way for the local church to be a team that wins. With a TEAM, you can reach your DREAM. In Matthew chapter seven there is an astonishing statement about bad leaders in the Church, made by the Head of the Church (no, not the Pope, Jesus Christ…nothing against the Pope though :). I say astonishing, because given the religious climate of the time, it was definitely not politically correct. I have read “How To Win Friends & Influence People” by Dale Carnegie, and this is not that. I felt I was missing something powerful in the familiar words I was reading, until I decided to check the chapter out in the Message translation. As Chef Emeril Lagasse is known for saying, “BAM!” It hit me hard. “Jarring” is another term for it. I was glad it affected me. As long as I can feel the effect of Jesus words, I am not beyond hope, and neither are you. Let me explain. Having been raised on the King James Version of the Bible, my understanding can sometimes be limited by the preconceptions that still drape my mind when I read this older version, as wonderful as it once was. My go-to versions are the NKJV, NLT, AMP, MESSAGE, and NET, in that order, but I use dozens. Thankfully you don’t have to be a Greek or Hebrew scholar any more to uncover the expanded meanings of any word or verse in the Bible. Online Bible software makes it easy, and many modern versions of the Bible help in this process as well. When I read verse 15, I was shocked at how absolutely brutal Jesus was on ministers that have lost their first love – um, er, that is putting it nicely. Dear fellow pastors, ministers, and every Christ-follower: none of us are beyond the deception and danger that Jesus referenced. It has repeatedly occurred throughout history, and is the principle reason so many today discount our God and distrust the “clergy.” (I really hate that term…not sure why.) We must be brutally honest with our own hearts before we can lead people as Christ intends, and I know it starts with numero uno. How about you? Physical blindness is not often an immediate condition. There are accidents of course that can cause it, but most lose sight gradually, over time. Cataracts, glaucoma, and macular degeneration, all progress with time when left untreated. So does spiritual blindness, which leads to faking it. Spiritual blindness results from knowing what God is asking us to do, and ignoring it, repeatedly. The theological term for this is “penal blindness.” Jesus said “to whom much is given, from him much will be required.” (Lk 12:48) In other words, God holds us accountable for the light we receive, and will judge us accordingly. In God’s love and mercy, He begins withholding light (understanding and revelation) when we begin moving into disobedience. He does this so He does not have to judge us. The result is somewhat akin to Hans Christian Andersen’s short story, “The Emperor’s New Clothes.” Our religious traditions (faking it) take the place of true spiritual revelation and direction, but we still think everything is okay. We be lookin fine, right? Wrong! Been there, done that, and even bought the T-shirt. Who hasn’t? But God had mercy on me, and still does, every day, and He will for you too. But we can’t “fake it till we make it.” We have to fall on the rock and be broken, and then He can use us. Multiplication always follows brokenness, as in the story of the five loaves and two fish. This was really funny when Jesus said it. I mean, seriously, can you imagine an “in your face” conversation where the Lord is saying this to falsely religious people? Talk about Laugh Out Loud. This is hilarious stuff…hit em again Jesus…unless He is saying it to you. Jesus was using hyperbole, meant to highlight their hypocrisy. Aren’t we sometimes just as guilty? Yup. We undo the effect of God’s Word every time we excuse ourselves from being doers of the Word, and become hearers only. But how did they become so blind? They became blind a little at a time. A little leaven leavens the whole lump. Ouch. I know. Truth is a two-edged sword…or maybe today we can call it a surgeons scalpel, the kind used to take out the cancer that will eventually kill us. If you can still say “cut me Jesus”, your gonna make it. The only way to prevent penal blindness is to repent quickly when we become aware of our sin. When we don’t, our hearts become desensitized to sin. When we don’t deal with our sins, even religious sins of pride, etc., they will deal with us. Religious sin, and all sin, is like seeds that will one day produce a harvest. You can fake it for a while, but harvest-time is coming. No thanks. God has better plans for my life, and yours. Repentance is a word that most today do not fully understand. It is not just feeling sorry for our sins and disobedience. Real repentance is a decision that always bears fruit. (Matt 3:8) This fruit is having a change of mind that agrees with God, agrees that He is completely right and we are completely wrong, and then takes action to change course and go God’s way. For instance, if am leaving Memphis TN and trying to go to Little Rock Arkansas (which is West), I may “feel” that going East is more appropriate. I may prefer going East. My habit may be to go East. But going East from Memphis is taking me to Nashville, not Little Rock. The best thing I can do is consult the road map (or GPS – Global Positioning System ) to determine the right course to follow. The Bible is God’s road map for our life on earth. It is God’s Positioning System. If you consult a map and find you are headed in the wrong direction, it doesn’t matter how sorry you may feel. It doesn’t matter if you cry about it, and tell others how sad you are that you are going the wrong way. It doesn’t matter if you tell people it’s just your nature to drive East, because that’s what you have always done (habit). If you are headed the wrong way, there is only one solution – EXIT & TURN AROUND! You must change your mind to agree with the map about the direction you are going, and then be willing to course correct. If you don’t get off the interstate when you are headed in the wrong direction, there is no repentance. Repentance is not a feeling or an emotion, it is a decision that is demonstrated by changing direction. There have been many times I was headed in the wrong direction. I was sincere, but I was sincerely wrong. I had to repent. Maintaining the wrong course never gets you to the right destination. Many church members, pastors, ministers, churches, Christian organizations, etc. are headed in the wrong direction today. They are building on the foundations of men rather than Christ. But there is a solution to the problem – TAKE THE NEXT EXIT & CHANGE DIRECTION. God is gracious and full of mercy, but we have to admit-it to quit-it. Only then does the fruit of repentance bring us back into alignment with the perfect will of our Father, and glorify Him. My prayer is that Jesus will help us never bring dishonor to His name through the sin of religiosity, or any other sin. I pray that He will help us find the place of repentance when we begin to fall away in our hearts, and that instead of faking it, we will deal with our sin before it deals with us. We need another great awakening, for His honor and glory and Kingdom expansion alone. I believe it is coming, but it will be the fruit of true spiritual vision, and real repentance from dead works. Our church builder for Rejoice Church, Rusty Kirk, declares that God is a Baseball fan because the Bible begins with “In the Big Inning.” And to be sure, the Creation of the heavens and the earth was the biggest inning ever. As the Master Architect of the Universe, God set a precedent with beginnings. Everything has a beginning, and very often the way a thing begins is also how it continues…or ends. The “seed” that is planted at the first has tremendous influence over what follows. Every beginning releases a “genetic code” of sorts that silently and invisibly shapes and guides the events that follow. A natural plant seed is self explanatory, as is the conception of a child. But the impact of beginnings, and new beginnings, affects so many other things. The habits we learn at an early age, both good ones and bad ones, have long term affects on how we conduct our lives. Something as simple as the way we start our day often affects how the rest of the day goes. Sports teams always want to score first in the game to propel them to confidence and victory. Beginnings are very important. God designed this into the universe, and our psyche. Babies need the care and nurture of a family, both naturally and spiritually. A baby learns its’ identity from it’s parents and siblings. A lack of proper “family” influence in the beginning can contribute to a life of emptiness, formlessness, and darkness. Without proper guidance and direction we may never find and fulfill our purpose. This is one of the many reasons the local church is so vital. The church is a family where new Christians can learn their identity in Christ. Jesus said His sheep know His voice. But He didn’t say His lambs did. So how do the lambs learn the Master’s voice? By following the sheep, who are the mature Christians who have already been formed by family and parental relationships. Family and formation take place through divine connections. Divine connections remove the darkness and confusion of formlessness. Only within the context of true family can we learn our true calling and purpose. But let me take it a step further. Local churches and ministries need to be in families too. Pastor Brian Moore stated at the Rejoice International Summit in May of 2014, “Not every network is the right network. You have to be in the right network for the net to work.” Profound yet simple. Each of us that are networking together with other churches bring something needed to the table that makes us all better. Our individual contributions strengthen and encourage. But this is only possible because there is a “table” from which to share. It is this common table that unites us in communion, and from which we all draw our inspiration and vision to do God’s work. I am seriously mad at the Devil. The Devil doesn’t play fair. We have to stop being surprised at the difficulties we face when we are serving the Lord. The Devil is good at being the Devil. But God is good at being God! And you are destined to win with God is you don’t give up!!! You will have to fight the good fight of faith. I tell my grands “whiners never win” when they are tempted to complain about their sibling getting the upper hand. They love that and giggle, and get back in the tussle. You need to as well. The Devil knows you are called to be dangerous, so he throws hand-grenades and plants land-mines to blast and cripple you into submission. He we use whatever it takes to stop you, if he can. 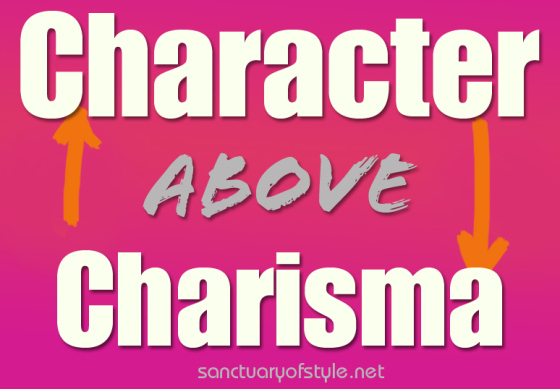 There is nothing too low for him to use, because he has no honor and no gentleman’s code of conduct. There is no Geneva Convention Rules. His only objective is your defeat. Dear child of God, you must not give in or give up. You must not settle for where you are and what you are experiencing. Don’t let your present condition become your permanent condition. Defeat is not God’s plan for your life, it is not what Jesus died for, it is not God’s will and it is not God’s best. It’s time to get up and fight back in the name of Jesus. You are not destined to be defeated, you are destined to win. Be a soldier of the Cross and accept your call to be a bright and shining light in a dark and dying world. The world did not understand Jesus, and it will not understand you. But you must not accept compromise to be accepted. You must not betray the One who died to set you free. Jesus died to make you powerful, not comfortable. The Devil never takes a vacation, so stop going AWOL (absent without leave) every time he attacks you or hurts your feelings. Our warfare is not with flesh and blood. Jesus told Peter “get behind me Satan” and so must you. It is time to rise up in the authority of the name of Jesus and the power of the Holy Spirit, and go on the offensive. The gates of Hell cannot withstand the attack of the lowliest saint when empowered by Christ Himself. It is a given that the Devil will use every weapon at his disposal to discourage you from your mission in life. If your enemies do not work, he will use your friends. If poverty does not work, he will use prosperity. If unemployment does not work he will use promotion. If hardship will not work, he will use comfort. Never underestimate Satan’s high schemes to bring you down. He dreams of neutralizing you, sidelining you, destroying God’s plan for your life because he knows you are destiny. The Devil knows your destiny because he knows what Jesus Christ paid for you on Calvary. You are the Blood washed, born again, Spirit filled child of the Most High God. Your destiny is to rule and reign with Jesus Christ both in this life and in the life to come. You can win if you will not give up. You can win if you will quit making excuses. Quit excusing yourself form the hard work of dedication and devotion. You can rise up in prayer with a renewed focus on your true purpose. Don’t get discouraged. Don’t throw in the towel. This makes the Devil glad. But it’s time to make him sad. It’s time to let him know the deceptions and lies have not worked. It’s time to push back on your negative circumstances and declare you cannot be bought, you cannot be pacified, and you will not be satisfied with a lukewarm Christian life. I can feel Satan quaking in his boots as you read this. I know he knows you are through with weak willed living, and he is already scrambling for fresh ammunition. Don’t let him do it. Call him out right now. 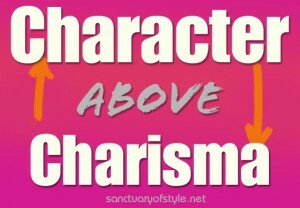 Declare yourself clearly and confidently. When the Devil tempted Jesus, our Lord’s only reply was to quote the Word of His Father. You must do likewise. Open your Bible, the incorruptible Word of God, and begin reading it out loud. Read Ephesians chapter six on spiritual warfare. Read Psalm 23 on the Lord being your Shepherd. Read your favorite verses. But by all means launch the Word of God with your words. Salvation and deliverance comes from believing in your heart and confessing with your mouth. It’s time to get off the fence. Stop being double minded. God has said He will be with them that are with Him. Are you on the Lord’s side? Shout AMEN!!! Then pick yourself up, dust yourself off, and throw yourself back into the fight. Read the back of THE BOOK – you win. YOU WIN IN THE END! YOU ARE DESTINED TO WIN IF YOU DON’T GIVE UP!! !